Former Puerto Rico Senator Hector Martinez Maldonado was sentenced to four years in federal prison for accepting high-priced boxing tickets in exchange for legislation favorable to a private company, the Justice Department announced. The man who offered the bribe — Juan Bravo Fernandez, the former president of Ranger American, one of the largest private security companies in Puerto Rico — will also serve two years in prison. 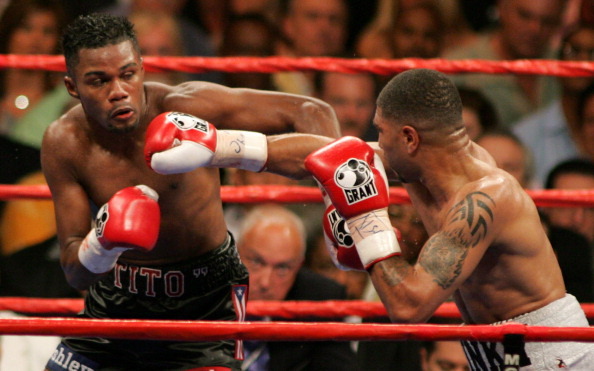 According to prosecutors, in 2005, Bravo Fernandez, 63, gave Martinez Maldonado, 49, and Jorge de Castro Font, 54, another former Puerto Rico senator, an all expenses-paid trip to Las Vegas to watch the fight between Hall of Famers Winky Wright and Felix “Tito” Trinidad, one of the most well-known boxers in Puerto Rico. The trip included first-class airfare to Las Vegas and hotel rooms at the Mandalay Bay Resort and Casino, as well as hotel rooms in Miami for a return trip back to Puerto Rico. On March 2, 2005 — the same day Bravo Fernandez paid for the $1,000 boxing tickets — Martinez Maldonado submitted a public safety bill that was favorable to Fernandez’s company. The day after they returned, Martinez Maldonado and de Castro Font voted in favor of the bill. De Castro Font pleaded guilty in 2009 to 20 counts of honest services wire fraud and one count of conspiracy to commit extortion. In 2011, he was sentenced to 60 months in prison. IN OTHER NEWS: Fire Fist Boxing Promotions will take over The Coliseum in St. Petersburg when they present a seven fight card Saturday, June 16. This exciting evening is headlined by unbeaten middleweight Connor “The Kid” Coyle as he looks to capture his first championship when he meets Danny “El Bebo” Pastrana for the NBA Middleweight title. One of Ireland’s top amateurs, Coyle captured a bronze medal at the 2014 Commonwealth Games. As a pro, the 27-year-old has a perfect 7-0 ledger with 2 wins by knockout. Representing his native Derry, Northern Ireland and his adopted hometown of Tampa, FL, Coyle’s two most recent victories came against previously unbeaten foes in Calvin Metcalf (6-0) and Joshua Maxwell (2-0). Fighting out of Orlando, FL, Pastrana is 6-4 with 1 KO. Pastrana has wins over two previously unbeaten foes and lost a close decision against future world title contender Wilky Campfort. On June 16, Pastrana looks to upset the applecart by conquering Coyle. In the highly-anticipated eight round co-feature, popular cruiserweight Nicholas “The Showstopper” Iannuzzi, 19-4 (11 KO’s) of Tampa meets Georgia-based Puerto Rican Vincent Miranda. Out of the ring for close to four years to help care for his special needs child, Iannuzzi made his emotional return March 3 and scored a dramatic third round knockout of Lemarcus Tucker. Miranda, 17-2 (9 KO’s), has a win over former NABO and USBA champion Brian Barbosa. Junior middleweight Ali Tarah of St. Petersburg looks to end his career with a victory in his six round fight against West Palm Beach, FL’s Jose Cortes. A veteran of 31 professional fights, Tareh owns a gym and promotes fights under the Pahlavan Promotions banner.